The San Francisco Arts Commission is working on behalf of Treasure Island Development Authority to commission a signature public artwork for Building One Plaza, which is located at Avenue of the Palms and California Avenue. The newly commissioned artwork is intended to acknowledge the importance of the landmark Building One, while marking the transitional nature of the site through the use of contemporary materials and styles. The scale of the artwork will correspond to the scale of the building and maintain a line of sight from Building One to the Bay, while also maintaining the original historic character-defining features of the building and landscape. 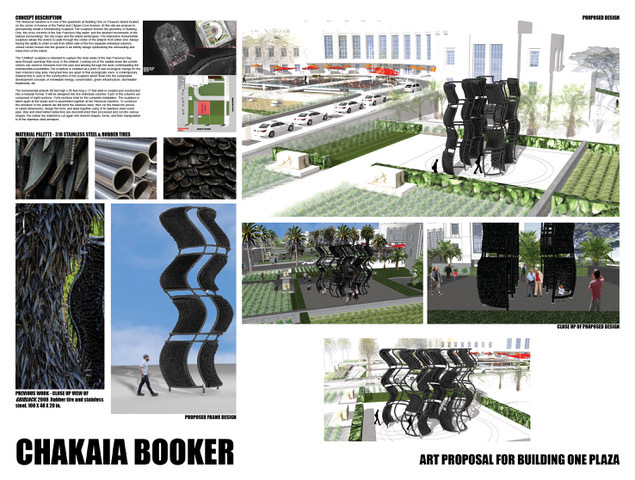 Three artists were chosen as finalists by a Public Art Selection Panel to create site-specific proposals for the Building One Plaza opportunity: Ai Wei Wei, Chakaia Booker, and Pae White. Ai Weiwei’s Rebar for Treasure Island is comprised of four large-scale steel sculptures that welcome visitors to Building One Plaza with artfully curving shapes that playfully animate the site. 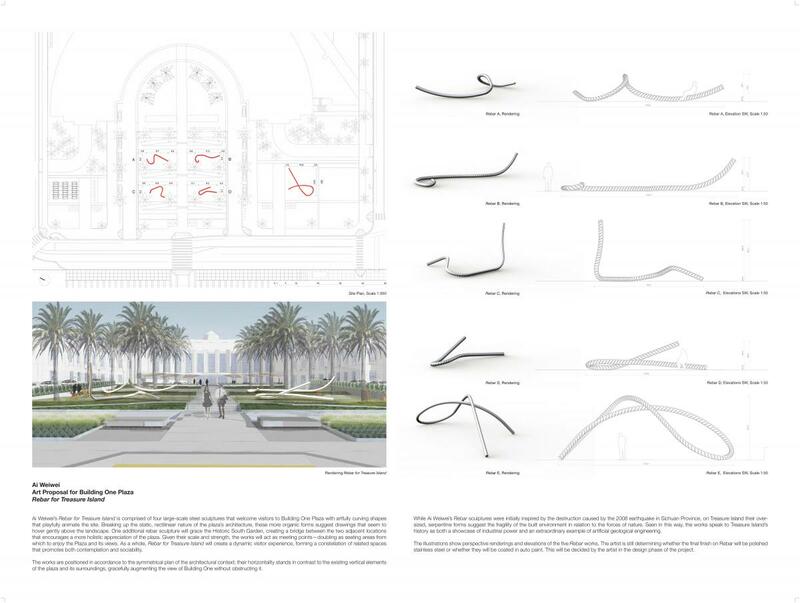 Breaking up the static, rectilinear nature of the plaza’s architecture, these more organic forms suggest drawings that seem to hover gently above the landscape. One additional rebar sculpture will grace the Historic South Garden, creating a bridge between the two adjacent locations that encourages a more holistic appreciation of the plaza. Given their scale and strength, the works will act as meeting points—doubling as seating areas from which to enjoy the Plaza and its views. As a whole, Rebar for Treasure Island will create a dynamic visitor experience, forming a constellation of related spaces that promotes both contemplation and sociability. The works are positioned in accordance to the symmetrical plan of the architectural context; their horizontality stands in contrast to the existing vertical elements of the plaza and its surroundings, gracefully augmenting the view of Building One without obstructing it. While Ai Weiwei’s Rebar sculptures were initially inspired by the destruction caused by the 2008 earthquake in Sichuan Province, on Treasure Island their oversized, serpentine forms suggest the fragility of the built environment in relation to the forces of nature. Seen in this way, the works speak to Treasure Island’s history as both a showcase of industrial power and an extraordinary example of artificial geological engineering. The illustrations show perspective renderings and elevations of the five Rebar. The artist is still determining whether the final finish on Rebar will be polished stainless steel or whether they will be coated in auto paint. This will be decided by the artist in the design phase of the project. The Historical Gardens is in one of the quadrants at Building One on Treasure Island located on the corner of Avenue of the Palms and Clipper Cove Avenue. At this site we propose to permanently install a freestanding sculpture. The sculpture echoes the geometry of Building One, the cross currents of the San Francisco Bay water, and the abstract movements of the natural surroundings. The city scape and the Island landscapes. The interactive monumental sculpture allows the visitors to walk through the center of the artwork from either end. Always having the ability to enter or exit from either side of the five separate individual columns. Joined circles incised into the ground is an infinity design symbolizing the rebounding and many lives of the island. The “Untitled” sculpture is intended to capture the vista views of the San Francisco Bay area through openings that occur in the artwork. Looking out of the spatial areas like portals visitors can observe remnants from the past and winding through the work contemplating the inexhaustible possibilities. The sculpture is installed at a point of vast ecological change for the San Francisco Bay area. Recycled tires are apart of that ecologically voice. A contemporary material that is used in the construction of the sculpture which flows into the sustainable development concepts of renewable energy, conservation, green infrastructure, storm water treatments, etc. 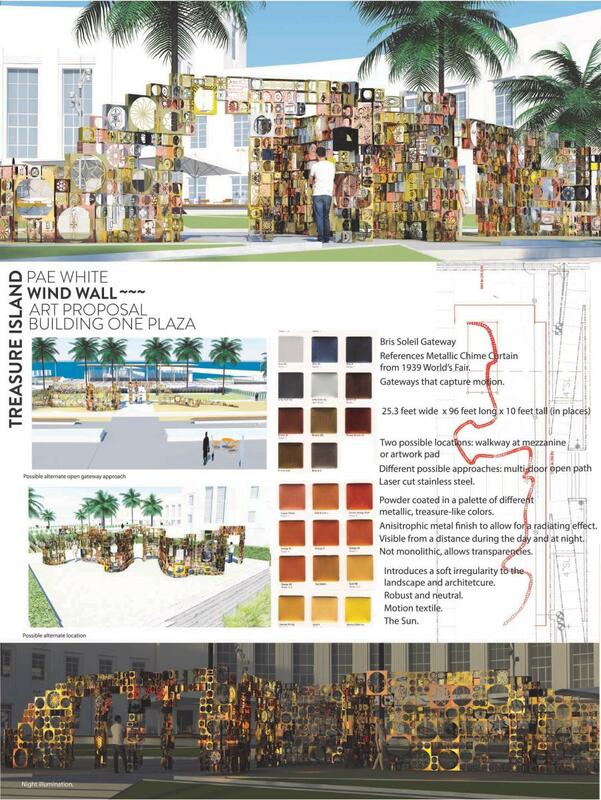 The monumental artwork 28 feet high x 35 feet long x 17 feet wide is created and constructed into a modular format. It will be designed into five individual columns. Each of the columns are composed of eight sections. Forty sections total for the complete installation. The sculpture is taken apart at the studio and re-assembled together at the Historical Gardens. To construct the armature of the artwork we will bend the stainless steel, then cut the metal into pieces of varied dimensions, design the form, and weld together using 3/16 stainless steel round pipe. Bias and steel belted radial tires are deconstructed then processed and cut into various shapes. The rubber tire material is cut again into desired shapes, forms, and then manipulated to fit the stainless steel armature. Stainless steel self-tapping fasteners, bugle head screws, threaded bolts, and flanges, etc. are used to attach the rubber tires to the stainless steel metal, rubber to rubber tires, and metal to metal. The final surface treatment on the sculpture is bias radial tires. Footings are also poured so the sculpture is bolted into the ground. The basic material used in the construction of this sculpture described above is rubber tire. Black rubber tires are ubiquitous and they are used here as a symbol of birth and rebirth and renewal for the island. Metaphorically this sculpture radically transforms tires to bridge the islands past with its future ideas. The swirls of tires create an amalgamation of organic materials, visual textures, and technology. The artwork will feel like a beacon drawing viewers up to explore the beauty of the landscape and the natural environment. Looking at the history of Treasure Island, especially the 1939 World’s Fair, I recognized an opportunity to remake a lost artwork. Behind the massive sculpture of the mythological figure Pacifica in the Court of the Seven Seas, there was something referred to to in the promotional video as a 100’ Silver Chime Curtain which “tinkled the tranquil song of peace…” I would like to propose a variation of that, give it depth, orient it horizontally in a serpentine layout, and in addition to creating sound, it would have numerous of spinning elements of different sizes harnessing the wind coming off the bay. An assortment of pattern and openwork would allow for a good amount of transparency to take advantage of the view of the ocean, the city and the landscape while at the same time creating pockets of intimate spaces. The proposal board references 2 possible locations for the Wind Wall. One in which the wall is split by the path to the plaza, each side approximately 12 feet tall by 1 foot thick and 48 feet long, the other in the open space to the south, but as a single continuous serpentine wall 12 feet by 1 foot and approximately 96 feet long. However, understanding that there are a number of contingencies with the site I am open to developing the options with Andrea Cochran and her team. The material for the wall would be laser-cut stainless steel, powder-coated in transparent tonal, neutral metallic, even “treasure-like” colors of gold, silver, copper, bronze etc. Some of the finishes would be mirror polish and some would be brushed for an anisitrophic finish to allow a feeling of light “radiation”. ADM Works (http://www.adm-works.com) has helped my studio with multiple projects using metal and harnessing the wind. In terms of working roles, Pae White Studio would explore possible layouts for the site chosen, then develop and finalize the design, at which point we would present it to the Art Commission. Once approved, we would then work with ADM who would engineer the piece and strategize the fabrication to facilitate assembly on site. During installation, Pae White Studio would be present to ensure proper placement and orientation and to verify that the piece is working as designed. Public Comment Period Closed on April 13, 2018, 5 p.m. Please contact: craig.corpora@sfgov.org or (415) 252-2249. Materiales traducidos están disponibles para usted de manera gratuita. Para asistencia, notifique a craig.corpora@sfgov.org or (415) 252-2249. 我們將為閣下提供免費的書面翻譯資料。 如需協助，craig.corpora@sfgov.org or (415) 252-2249. Ang mga materyales na nakasalin sa ibang wika at ang mga serbisyong tagapagsalin sa wika ay walang bayad. Para sa tulong, maaring i-contact si craig.corpora@sfgov.org or (415) 252-2249.